Dean Barker sheeting in at the start of Race 5 of the Aussie A Cat Nationals 2011. Image copyright Mia Hacker. I have done nearly 3 weeks of practice in an A Class boat at home to get used to the boats and have taken delivery of a new DNA boat in Australia [for the Nationals]. Glenn Ashby has been great giving me a lot of pointers on getting setup and techniques on how to sail the boats well. It is quite different sailing in the multihulls after so many years devoted to monohulls. The biggest changes are the lack of instant maneouvreability and the way the tactics change for big fleet sailing. 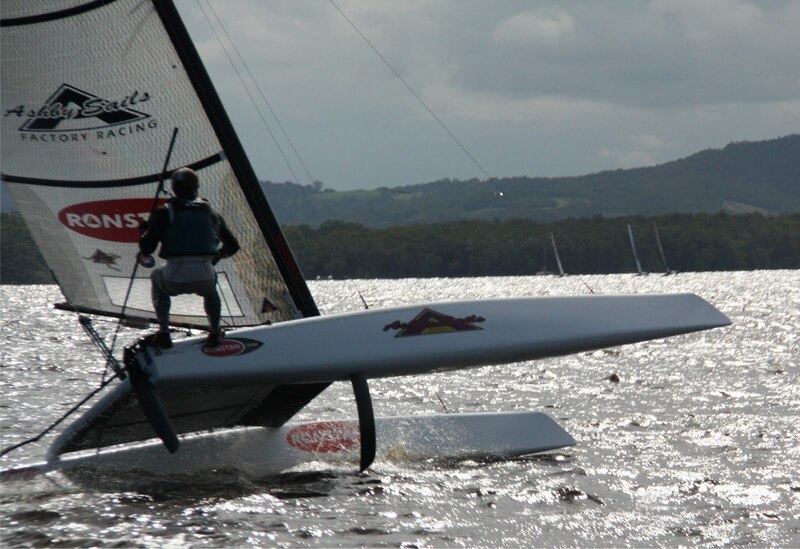 [Very flat water on Lake Cootharaba in Queensland makes it ideal for A Cat sailing.] These boats are exhilirating to sail being 18ft long, weighing all up 75kg ready to sail, and with a trapeze there is plenty happening. The practice race in the Aussie A Class Nationals [was] also the first time I have ever lined up on a startline in an A Class. Needless to say in a 73 boat fleet I was a little apprehensive. With 3 general recalls this gave me some much needed practice which was ideal. Controlling the boat on the line is a tricky thing to do well and the good guys are great at doing it. [I] had fantastic speed upwind to have a nice lead around the first mark... I lost places downwind during the race and gained some upwind. All in all I [was] very happy with my first day of racing and plenty to work on...especially downwind! I am absolutely wrapped with the way I am going upwind and after such a short time in the boat being right on the pace. Downwind there is a huge amount of technique to work on and although I feel I am improving the periods where I am not sailing well I do lose a lot. My downwind speed was better but I still couldn't hold off a couple of the guys on the first run. In the end I placed 4th which I was pleased with. The next race was really exciting and I managed to lead around the top mark all 3 times but unfortunately the races finish downwind and I had another 4th after dropping 3 places on the last run in a very tight affair. Again I am pleased with the way it is going but even though I am improving downwind there is a long way to go. No racing on Day Four. Glenn Ashby: A-Cat Australian Champion 2011, and reigning World Champion from 2010. Image copyright Mia Hacker. [On] the final day of the Australian A Class Nationals... it was all very close at the top of the fleet. Although Glenn Ashby was well clear, I went into the day 4 points out of 2nd place in 5th overall. It was certainly a great way to finish off the event with it so close. I was going well upwind and hanging in downwind [in the one race on the last day]. I finished 5th overall 2 points out of 3rd (Darren Bundock), with Glenn winning from Steve Brewin, repeating their 1,2 finish at the 2010 Worlds and highlighting the depth in the Australian fleet. There were 5 competitors in the regatta who finished in the top 10 in the last Worlds. I have finished here incredibly pleased with the progress I have made to date but realise I still have so much to learn about multihull sailing. It is great fun but also a very steep learning curve. Note from SailRaceWin: Very impressive performance! Next up it will be Extreme 40s, the slightly ungainly overgrown versions of a Tornado, and a test of cat sailing with a crew.... After this, on to wingsails on crewed cats, and the AC45... and then the AC72.